An unpretentious guide for all those who want to learn to analyse, understand and evaluate films. 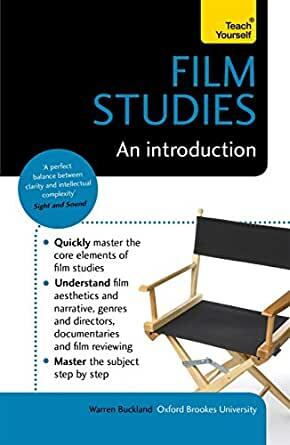 Film Studies: An Introduction provides an overview of the key areas in film studies, including aesthetics, narrative, genre, documentary films and the secrets of film reviewing. From Hitchcock and Tarantino to Spielberg and Bigelow, you will gain a critical understanding of legendary directors and the techniques and skills that are used to achieve cinematic effects. Whether you are a film studies student or just a film buff wanting to know more, this book will give you an invaluable insight into the exciting and incredibly fast-moving world of film. All key components of the Discussion Board Forum prompt are answered in the thread. • Headings that indicate the key points related to your analysis and that indicate key parts of your post. • Required word count (250 words) is met. • Communication follows Student Expectations. • Citations in current APA format. • Contribution made to discussion. • Required word count (100 words each) for two replies is met.